Arizona State University researchers have found that larger tropical stingless bee species fly better in hot conditions than smaller bees do. Larger size may help certain bee species better tolerate high body temperatures. The findings run contrary to the well-established temperature-size "rule," which suggests that ectotherms—insects that rely on the external environment to control their temperature—are larger in cold climates and smaller in hot ones. The research will be presented today at the American Physiological Society's (APS) Comparative Physiology: Complexity and Integration conference in New Orleans. In the new study, Duell and her collaborator, Jon F. Harrison, Ph.D., measured air and thorax temperatures of 10 species of stingless bees—which varied in body mass between 2 and 120 milligrams—to assess how well bees fly at high temperatures and the variations seen based on body size. The researchers also measured leaf and flower surface temperatures and air temperatures in sun and shade within the bees' native tropical forest canopy. "Essentially the bigger bees are exposed to higher temperatures—sometimes in excess of 10 degrees Celsius hotter than air temperature—because they produce a lot of heat while flying. 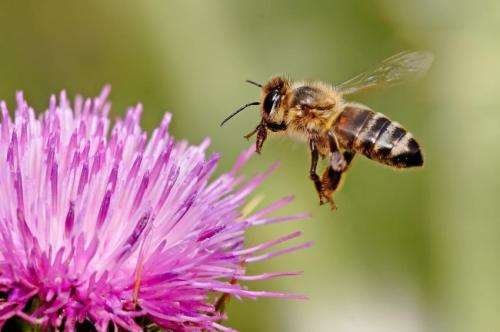 That same heat producing ability gives them an advantage in cooler regions as well because they can be active earlier in the morning, later into the evening or on cooler days compared to smaller bees," Duell said.